I’ve long been interested in the Shibori technique and found this blog post so interesting! So interesting, in fact, I wanted to share the beautiful images and information on my blog. After knitting a scarf in garter stitch with Kauni’s 140Effektgarn www.kauni.com, using a size 10-1/2 needle, I decided to add wooden beads of various sizes for resists. 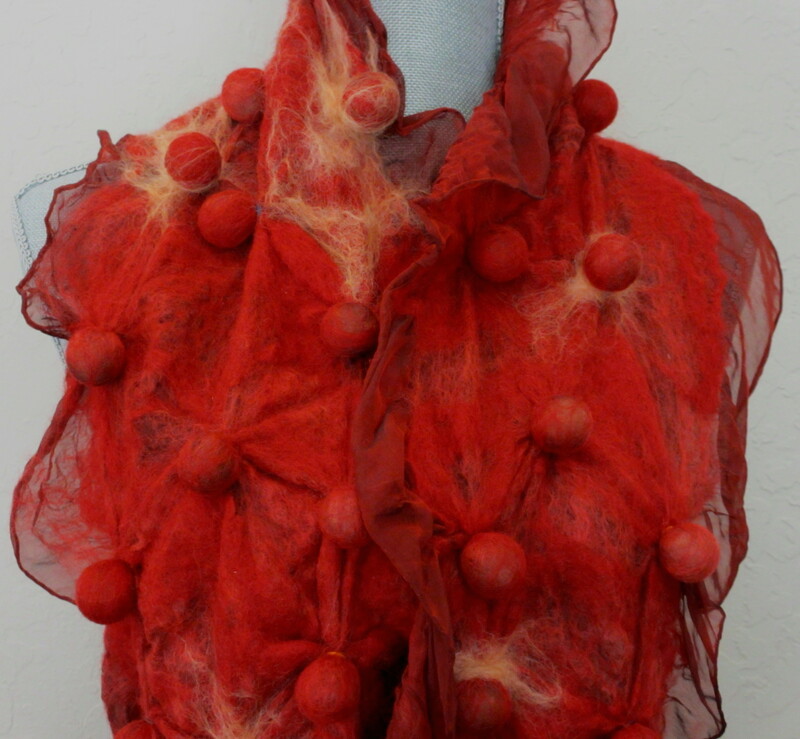 After the fulling process, I was amazed at the sculptural piece of textile that emerged. Upon removing the wooden beads, random tops of the indivdual sculptures were cut-off. 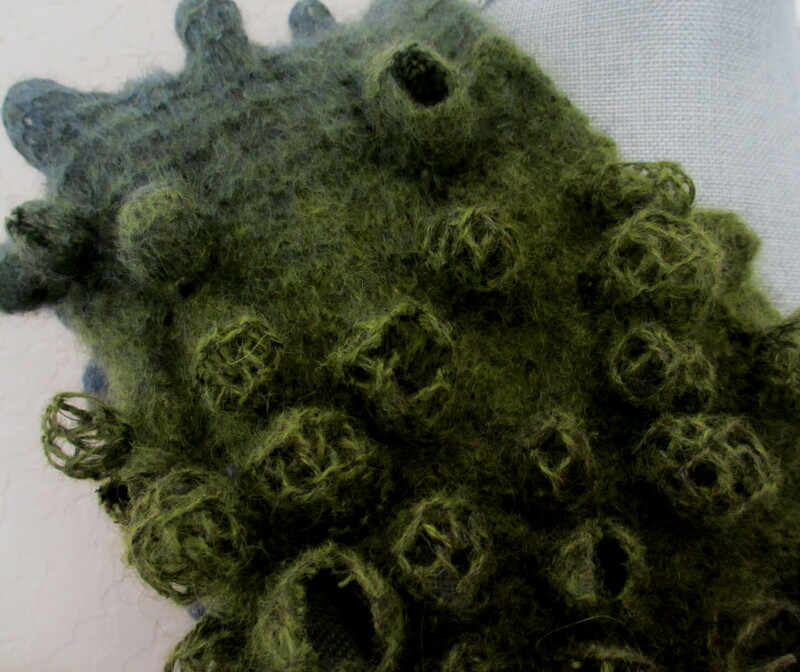 The frayed edges and openings add depth to the dimensionality of the felted textile. The randomness of resistance paired with the openness of the piece invites the admirer to look beneath the surface. Manipulating the piece to visually examine the change of surface, triggered a memory. The act of looking, color and dimensionality brought back memories of exploring the coastline in Northern California with my daughter. While the opening and closing of sea anemones kept rhythm with the in and out of the tide, we climbed on the frayed edges of rocks searching for jellyfish, sand crabs and shells amongst beds of kelp. Many times, one idea leads to another idea, which opens up a plethora of possibilities. 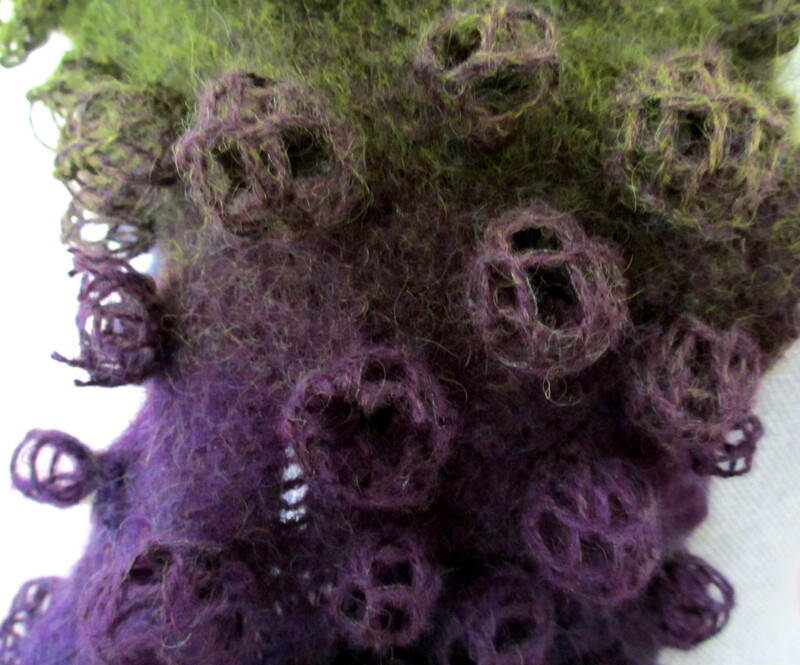 That’s what happened when I, knitorious, decided to combine the technique of nuno felting and the art of shibori. The manipulation of wool fibers with a woven structure along with resistance co-mingles two opposite actions. 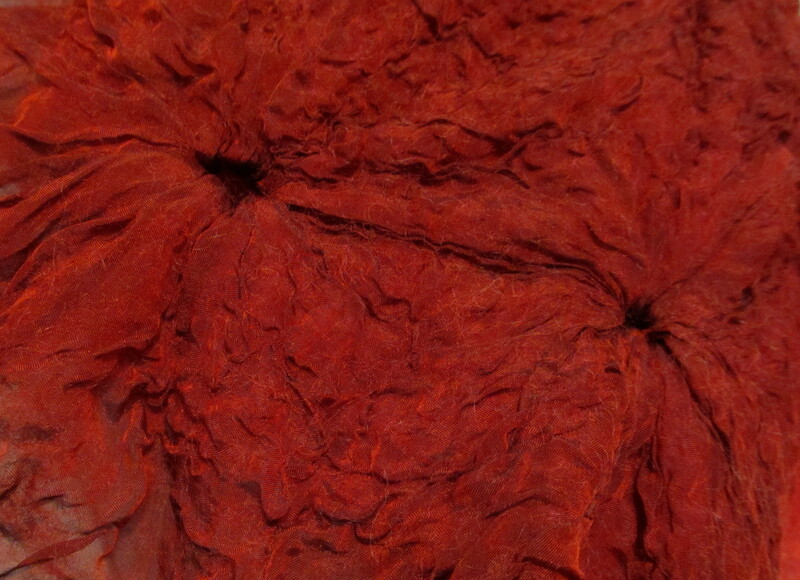 On the surface of a pre-dyed silk scarf, wool roving of two different colors were delicately placed, one layer horizontal and the other vertical. When the fulling process progressed to the point where the silk scarf began to pucker, wooden beads with a cocoon of yellow/orange-colored roving were each encased with a silicone band. The action of resistance along with the manipulation of the wool fibers and the woven structure of silk metamorphose the silk scarf into an intriguing sculpture. Shibori is a Japanese term for several methods of dyeing cloth with a pattern by binding, stitching, folding, tucking, compressing it or capping. The manipulating of the cloth, resists the dye, which decorates the surface with pattern. 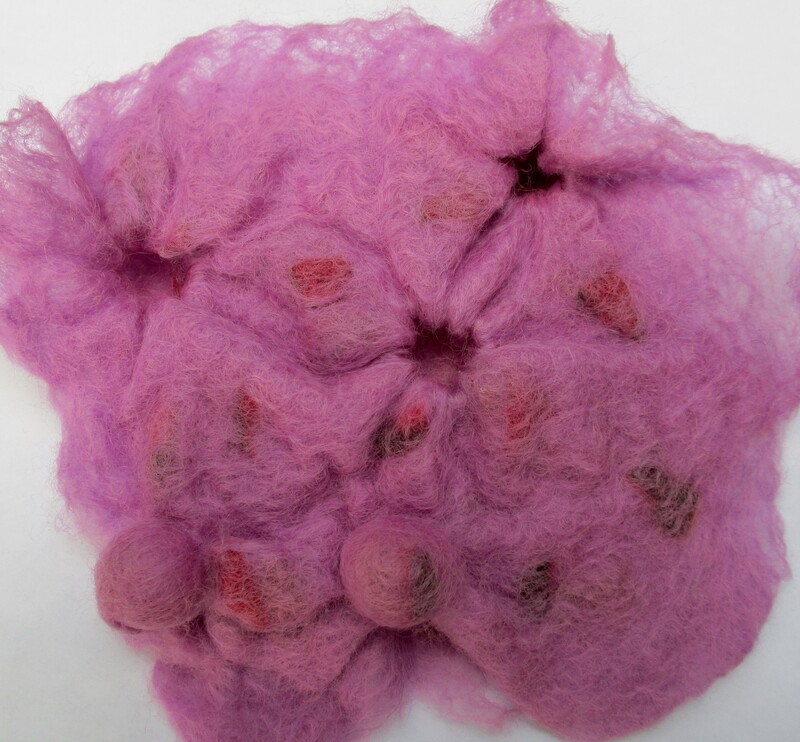 The same can be achieved during the fulling process in felting. 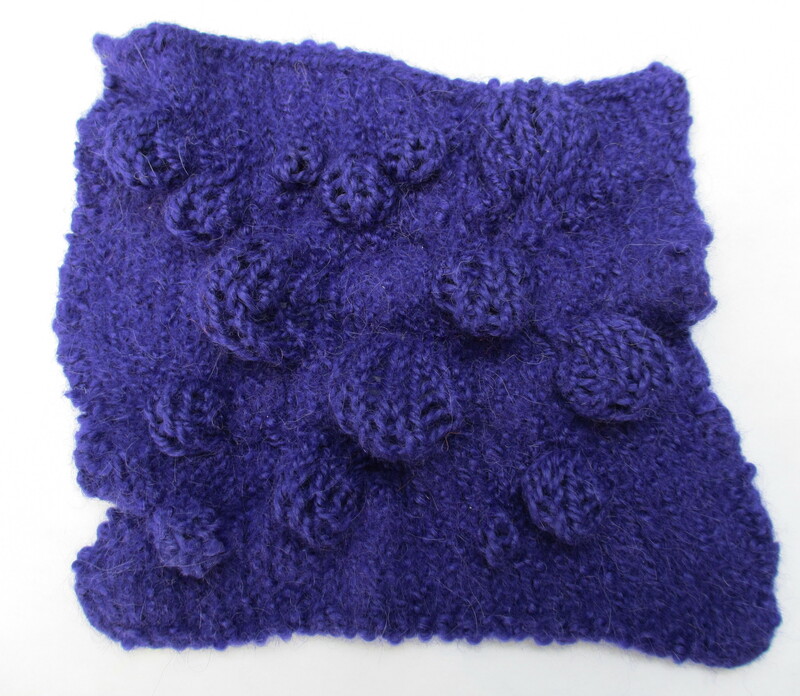 Adding (wooden beads, buttons, nuts, etc., secured with silicone bands (similar to rubber bands) to the surface of knitting resists felting. Various sizes of wooden beads were used for the first blue/purple swatch. 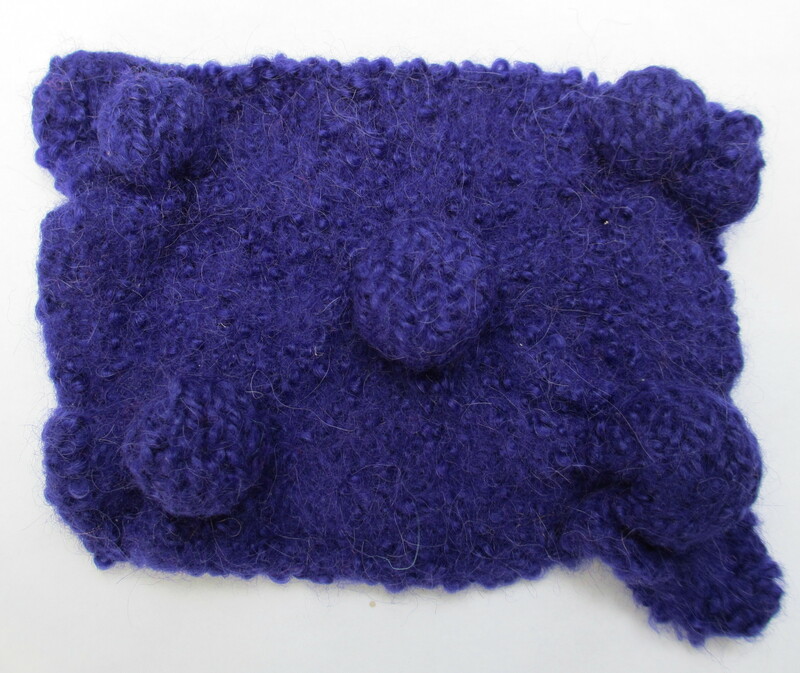 Plastic buttons were used for the second blue/purple swatch. 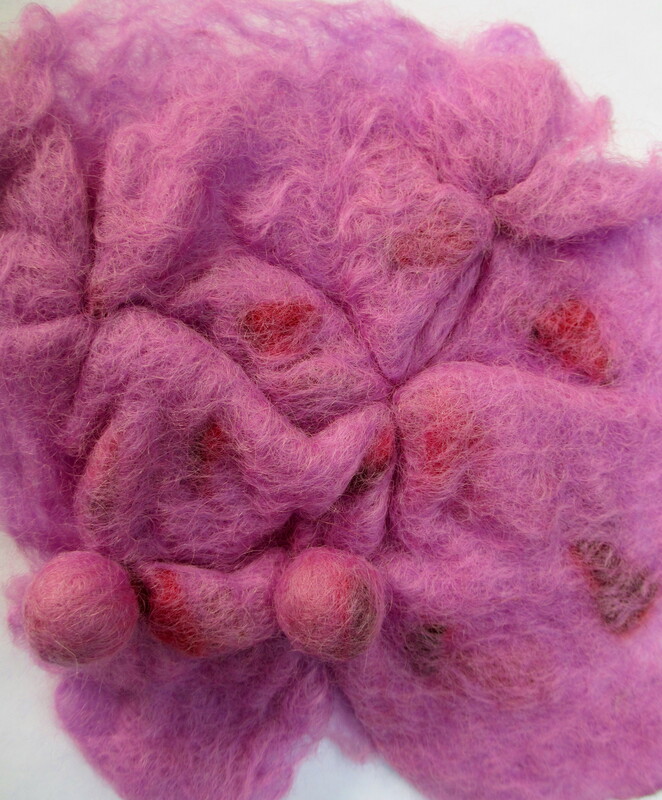 I decided to try adding resists while wet felting roving. The third swatch (pink/lavender) was manipulated with pre-felts and once the fibers began to full, I added wooden beads secured with silicone bands. I continued the process until the swatch felted to my desired likeness. After the swatch (pink/lavender) was completely dry, I cut the silicone bands and removed the wooden beads.